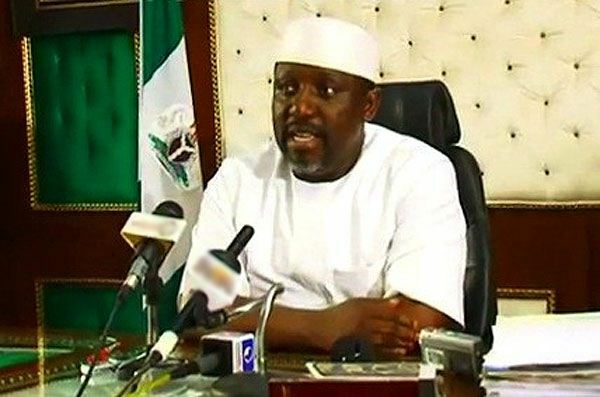 Learn Work or Risk Arrest, Rochas Okorocha Tells Unemployed Youths – Huh? Unemployed youths in Imo have been advised to enrol in the “Youth Must Work Programme” of the state government to engage in viable activities. Gov. Rochas Okorocha of Imo gave the advice at a Town Hall meeting he held with youths and people of Ikeduru and Mbaitoli Local Government areas of the state. He said that the current administration introduced the programme and other empowerment projects as part of measures to keep Imo youths away from anti-social activities. Okorocha said that with the programme in place, there was no reason for any Imo youth to roam the streets or engage in anti- social activities. He, however, warned that youths, who failed to engage in meaningful activities, would risk arrest by May. The governor, who inspected projects at the two local governments in company of his deputy, Mr Eze Mmadumere, expressed optimism that the meeting would bring about new focus and programmes for the areas. He said that his government had put machinery in place to ensure that all projects initiated by the current administration were completed. “I will not start any project that I will not finish. It is not in my character,” he said. Okorocha assured the people that the state would continue on the path of progress in terms of infrastructure and social development. He urged the people to resist any government that would put the free education and other current development programmes of the state government on the reverse. The governor approved the building of 14 new primary schools for the people of Ikeduru and awarded the construction of two additional roads for the people of Mbaitoli as special packages. He expressed regret that out of the 24.8-km road approved for Ikeduru at the cost of N1.48 billion, only about five kilometres had been tarred. The governor said that N705 million had been paid to the contractors, assuring that no contractor would be allowed to embezzle money meant for road construction. Earlier, Mmadumere who hails from Mbaitoli/Ikeduru Federal Constituency, said that the governor’s visit had provided opportunity for the people to get acquainted with programmes of government. Madumere urged the people to continue to support the government. In his address, the Chairman, Transition Committee of Ikeduru Local Government Area, Mr Obinna Nshirim, applauded the governor’s policies on education, healthcare and aggressive rural road transformation. That of Mbaitoli, Dr Pat Nnah, expressed confidence in the visionary leadership of governor and assured of the continued support of the people of the area. The Chairman, Imo Council of Traditional Rulers, Eze Samuel Ohiri, who also hails from the area, appealed to the people of the area to reciprocate the governor’s kind gesture by giving him massive support. Two members of the state House of Assembly representing Ikeduru and Mbaitoli Constituencies – Mr Sam-Daddy Anyanwu and Mr Victor Ndunagu- said the governor had performed creditably well. Ndunagu appealed to the state government to capture construction of more roads in its budget for Mbaitoli to compensate for its land mass and large population. This entry was posted in News, Politics and tagged Latest about Governor Rochas Okorocha, Learn Work or Risk Arrest, Rochas Okorocha Tells Unemployed Youths - Huh?.